There are several electric motor types that use brushes for d.c. operation. These have two wires. Reversing th polarity of the applied voltage reverses the rotation. These have 4 wires. One pair (the armature) is low resistance, the other is higher resistance. May have two or 4 wires. The two wire type cannot be reversed. These are a type of field energised motor where both field and armature van be varied. PM motors generally have only two wires (though some have 4) and their body is generally magnetic enough to attract paper clips etc, due to stray leakage from the field magnets. Reversing the polarity of the armature connections will reverse the direction of rotation. However not all P.M motors are properly reversible. Some are manufactured for optimum performance in one direction only. In the field energised motor some of the motor’s power is wasted, energising the field winding (hence field-energised) whereas in a permanent magnet motor there is no field winding as the magnetic field is provided by permanent magnets, not by electrical current. Therefore for battery operation permanent magnet motors are best as their efficiency is theoretically better than that of the field energised type. Modern PM motors are also generally smaller that field energised motors because modern magnets are smaller that the windings needed to give the equivalent field. The Permanent Magnet motor has a fixed top speed which is dependent on the voltage fed to it (which is how a speed controller varies the speed – by altering the voltage fed to the motor). It the motor is rotated faster that this top speed then it tries to become a generator (if the controller will allow) and the generated power acts to brake the motor. PM motors are therefore ideal for invalid vehicles, kiddie cars, golf buggies, model locos and similar vehicles where the speed should be under control at all times and the vehicle’s designed top speed should not be exceeded. D.C. motors may not be so suitable for open road vehicles, where the ideal is to gain maximum speed going down hill with the intention of using the momentum to get up the next hill, though road speed restrictions rather spoil that form of energy saving! To reverse a PM motor, you must reverse the direction of the armature current either with a high current switch or relay, or with a suitable controller. 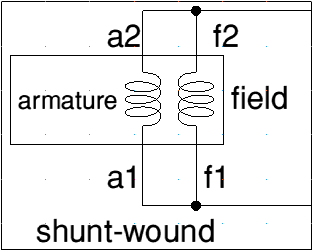 Shunt-wound motor generally have 4 wires. Two connect to the (relatively) high resistance field and two connect to the much lower resistance armature. In the shunt wound motor, the battery voltage is connected across the field winding. A steady current (equal to the battery voltage divided by the resistance of the field winding) flows in the field winding, causing it to become an electromagnet. These motors behave exactly like a PM motor, but with the permanent magnet replaced by an electromagnet. Usually the field winding is brought out separately from the armature, so the motor has four wires. With an ohm meter you can check that there are in fact two windings, a high resistance one (the field) and a low resistance one (the armature). To control the speed, connect the field winding directly across the battery and drive the armature from a controller as if you are using a PM motor. The simplest way to reverse the motor is to use a double pole changeover switch to reverse the connections to the field winding. Since the field winding uses much less current than the armature, only a low current switch is required. Of course, as with any motor, you should never change direction when the motor is running. You can of course use a normal reversing controller (e.g. our DNO series) and use armature control, with the field permanently wired to the battery, or you can use the parking brake driver to switch the field on and off to save battery power. Parking brake driver is suitable for field currents up to one ampere. Or you can use a reversing controller and reverse the armature. In this case it may be convenient to choose a a controller with a parking driver which can be used to energise the field, either directly or via a relay. This will de-power the field when the motor has stopped, increasing battery life. The magnetic field intensity of the field is proportional to the current flowing in it. If you reduce the field energising voltage, then you reduce the field current. Now, as the motor rotates, the armature cuts through the magnetic field, generating a voltage which tends to counteract the applied voltage (which is why it is called back EMF, or Electro Motive Force). The magnitude of the back EMF is proportional not only to the speed, but also to the intensity of the magnetic field. If you reduce the field voltage, then the armature must go faster to give the same back EMF with the reduced field. So you get the curious effect that if you reduce the armature voltage the motor goes slower (as you might expect) but that if you reduce the field, then the motor speeds up. 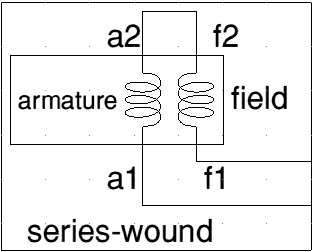 Reversible Series-wound motor generally have 4 wires. Two for the armature and two for the field. Both windings will be low resistance and, with an ohm meter, it can be difficult to tell them apart! Reversing the connections to either the field or the armature will reverse the motor. Two wire series wound motors exist, such as the common car starter motor. These are not reversible without serious modification to the motor and even then, they are not good! In a series wound motor, the armature current flows through the field winding, which is a high current winding in series with the armature. This series connection gives the series wound motor a performance much different to the PM and shunt wound types. In particular you cannot get either regenerative braking or accurate speed control with a series wound motor. Motor speed is neither defined nor measurable by the back emf: it is heavily load dependant. To get regeneration, you need to maintain a magnetic field as the armature current passes through zero. Then, as the armature back emf decreases below the applied drive voltage, the armature current will reverse (if the controller allows this). But you cannot do this with a simple series wound motor as the magnetic field collapses to zero as the armature (field) current reduces to zero. So there is no back emf at zero armature current, so the current can never reverse! If you switch the field coil’s polarity, then the direction of drive reverses and you can get plug braking which is often jerky and always inefficient. But the current supplied by the controller is still positive (drive) and has not reversed as it needs to to get regeneration. All that happens is that the power supplied by the controller gets used reducing the load’s kinetic energy – and all the power (supplied by the controller and supplied by the loss of KE) simply gets dissipated as heat in the motor. However, because of this series connection, the series wound motor will therefore work equally from a.c. or d.c. In fact they are sometimes called ‘universal’ motors for this reason. To reverse such a motor you cannot simply reverse armature current, but you must use a high current double pole changeover switch or relay to reverse either armature or field connection. This is OK if the motor has been designed for reversing, but it is not practical with something such as a car starter motor since with these you cannot readily separate the field and armature. One feature of series wound motors is that they don’t have a theoretical top speed: as the armature speed increases, so the current reduces. As it does so, the magnetic field reduces. As the field reduces, the motor needs to rotate faster to give the same back EMF. As the current reduces to zero, the perfect motor would get faster and faster to give an infinite top speed under zero loading. Fortunately perfect motors don’t exist and there is always some residual magnetic field and some friction. Nevertheless some early traction motors had a nasty habit of over revving to destruction if a drive shaft broke. This over-revving is also the rationale behind compound wound motors, where an extra shunt wound field provides a permanent field to restrict field reduction and to limit top speed. This feature of the series wound motor makes it probably a good choice for open road vehicles, where a limited top speed isn’t so desirable, and where you want to gain momentum down one hill to get up the next. However when you run a series wound motor at slow speed with a small mechanical load it becomes very inefficient. A car starter motor run like thus can draw 35 amps and do nothing at all. Low speed control can therefore be a problem. It is possible to use 4QD controllers with series wound motors: the Porter series are directly suitable but you will have to arrange your own reversing arrangement along the lines shown in this diagram. Uni 4 and 8, now replaced by the Porter 5 and 10. 1QD and 2QD, now obsolete. The 4QD series can also be used. We have an application note available which explains a method (and some problems). VTX series controllers. These can be relatively easily modified so that the on-board relays control the reversing. An application note is available on site. Pro-120 and Pro-150 series and DNO. In theory, the modification to these is the same as to the VTX series but because of their construction, it is not really practical. Note the extra diode connected across the field winding. You can usually get away without this diode but for best results it should be present. The reason is that armature and field windings have different inductances so the current in each will try to decay at different rates. The extra diode allows the field current to ‘do its own thing’ irrespective of the armature current. The current rating of this diode will depend on the motor but it will not get very hot as it is only conducting for a small part of the switching cycle. Fortunately there is, in theory, a way of overcoming the problems with a series wound motor: use two controllers, one to operate the field and the second to operate the armature. The controller for the field must be set to deliver a current to the field. This controller is not varied but simply supplies a constant energising current to the field. The advantage is that the field current can be set for maximum motor efficiency. The second controller controls the armature and the motor will now perform exactly as if it were a permanent magnet motor, giving regenerative braking and reversing from the armature. Sorry, we have no application note available on this and we have no more information to supply. If you wish to do it, you’re really on your own, but if you’d like to share the details, maybe we can write an application note for others. To many, this seems like an easily available motor. But in fact they are not good motors for conventional uses and we really cannot advise their use under any circumstances. Nevertheless, they can be satisfactory – but if you have one in use that isn’t quite right and ask us for a suitable controller, don’t be surprised if we cannot give much help! You can’t make a silk purse etc., and starter motors generally qualify as “sow’s ears”! Adding a controller to a bad motor may work, but we cannot advise that it will cure anything, so you use such a combination at your own risk. The problem is that they are designed for very high current intermittent use (very low duty cycle). They require a lot of current to create enough field even to make them work – just to start them rotating you have to pass around 35-40 amps through a starter motor. To get any sensible torque needs 80-100 amps, which will quickly overheat them. In a car, in normal use, they will take maybe 200 amps for the few seconds of starting. This is OK for intermittent use – but not for any length of time as the motor will rapidly get too hot and burn out. This design makes the starter motor impractical for any use as a conventional motor. If you are an experienced engineer (but then why would you want to do so?) a starter motor can be optimised by complete overhaul: make sure the bearings are very free and the commutator and brushes are in optimum condition to minimise friction. Starter motors are also series wound (although some of the more recent ones are permanent magnet, to which these comments won’t apply) so they won’t regenerate. It is also very difficult to re-wire them to split the field (necessary to reverse them) – so they cannot be reversed. Compound wound motors are a type of field-energised motor which are designed for a special double controller. Both field and armature are adjusted to alter speed and torque. They therefore have most of the characteristics of a shunt-wound motor but with significant improvements, at the cost of a more complicated controller. Compound wound motors are relatively uncommon and 4QD do not supply controllers for these motors.